Need specific promo codes for the holidays, sales or new customers? 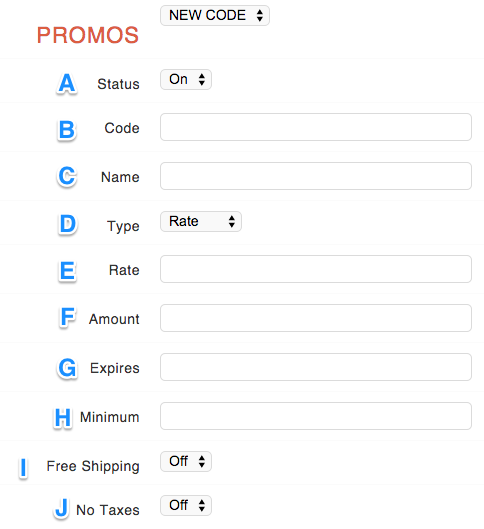 You can easily create and edit your promo codes for your eCommerce Storefront. Promo codes allow you to give customers a code they can use at checkout to generate specific discount like 15% off, $10 off, or even Free Shipping. 1. Go to Settings > Storefront and click Promo Codes. Status: Change the status of a promo code to be on or off. Code: Enter the code you want your buyers to use at checkout. The code is not case sensitive so if you have BUY123 and they enter buy123, it will still work. Name: The display name of the promo code. After the buyer applies the code, this will display for the buyer to show they’ve applied a promotional discount. Type: the two options are Rate and Amount. Rate gives a discount based on a percentage of the order subtotal. Amount: If entering a Rate Type, disregard this field. To honor $5 off, enter “5”. Expires: Every Promotional Code must have an expiration date. The date selected will be the date it no longer works. Example: If you select December 31, the last day to use the code is December 30th. Minimum: This is the minimum amount a customer must spend before they can apply the promotional code in your site's currency. Free Shipping: If turned “On,” then the code will also remove any shipping cost – this can be combined with a Rate or Amount Promo, or standalone. No Taxes: Similarly, if set to “On,” then the code will remove any tax cost. Note: You MUST click Save Promo to save your code. Clicking Save Settings at the very bottom will not save the promo code. 3. Modify any field on the code except the code itself (see above section for reference). Note: If you enter a different “Code”, it will create a new code, leaving the old one active for customers.